Another birthday has been and gone in the Angel Eden Blog household and yet again I made the silly mistake of asking my son what kind of cake he would like. This always seems like a wonderful idea until it comes time to actually bake and suddenly the realisation that this might be tougher than I anticipated sets in! This year he enthusiastically requested a Pikachu Cake! 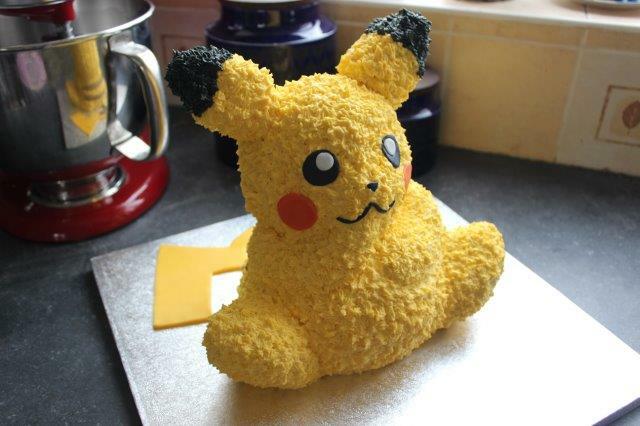 Even more specifically he wanted a fat fluffy Pikachu cake!! Pokemon Go has a lot to answer for. Thankfully Pikachu is somewhat light on the colour differences so he was actually quite a quick cake in comparison to previous requests which required millions of bowls/pieces of icing mixing up. I was quite chuffed with the finished product, although getting him to the party in one piece was nerve wracking, I became convinced one of his ears would fall off! He seemed to go down very well with all the party guests, although the moment we chopped his head off did feel a little sad lol. 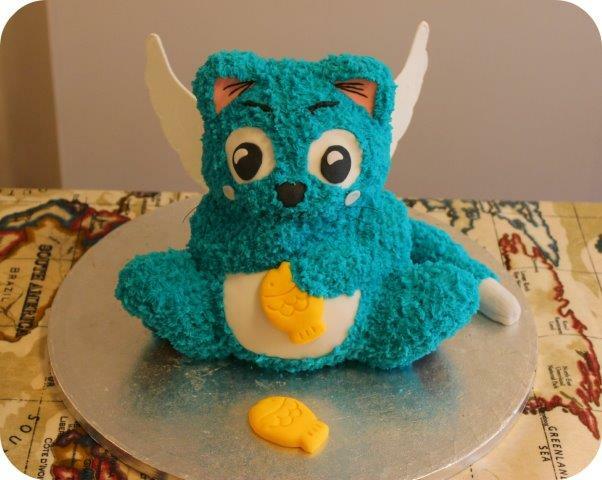 Of course they’ve immediately requested various other Pokemon cakes but for the moment at least they’ll have to wait, although I’m semi tempted to make a Jiggly Puff because he was my favourite character when I was little 😀 In fact I joined in with the Pokemon Go mania with the sole intention of catching one and now that I have I’ve somewhat lost interest, that plus it seems to need constant updating and drains my phones battery like nothing else. Mind you I have a very short attention span when it comes to games in general (much to my brother’s annoyance when I would quit two player games when we were little). 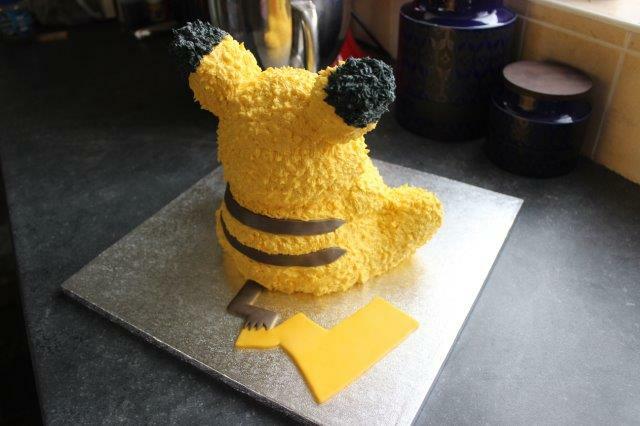 Have any of you guys ever attempted to make a Pokemon cake, I’d love to see some other variations. 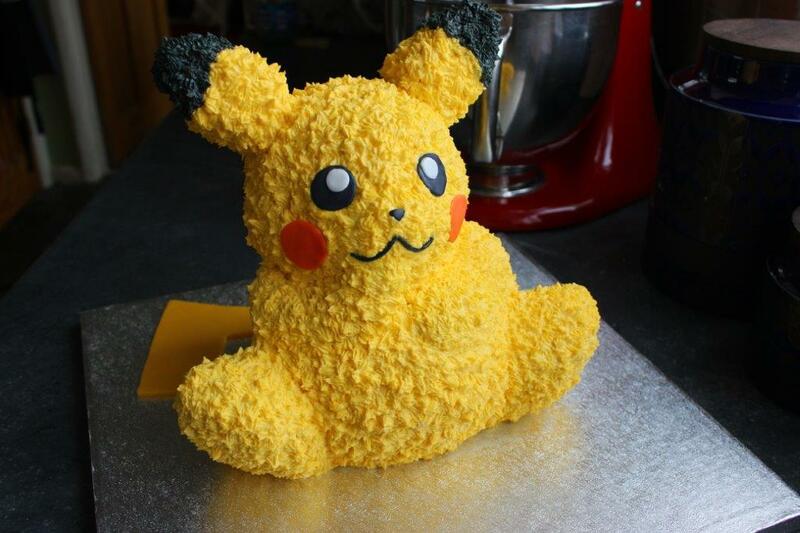 Overall I’m very pleased with my fat fluffy Pikachu cake. We recently had a birthday in the Angel Eden household and if there’s one thing that birthdays mean it’s cake! 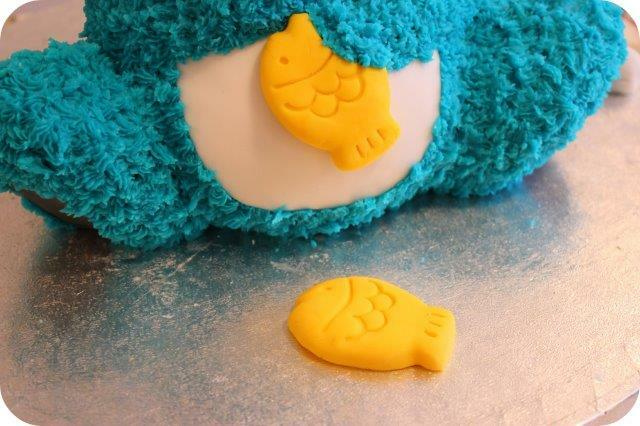 I always check if there’s any particular theme that my kids want for their cake but I usually regret it when they request something complicated and seemingly impossible! This year the request was to have a Happy from Fairy Tail cake. For those unfamiliar with Fairy Tail it’s a Japanese Anime series following a group of wizards who face various magical challenges and threats. 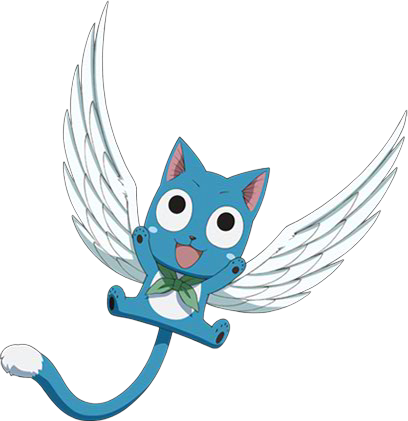 One of the main characters ‘Natsu’ has a flying blue cat (or Exceed to be precise) called Happy who joins the team as they battle foes and grow in magical ability. 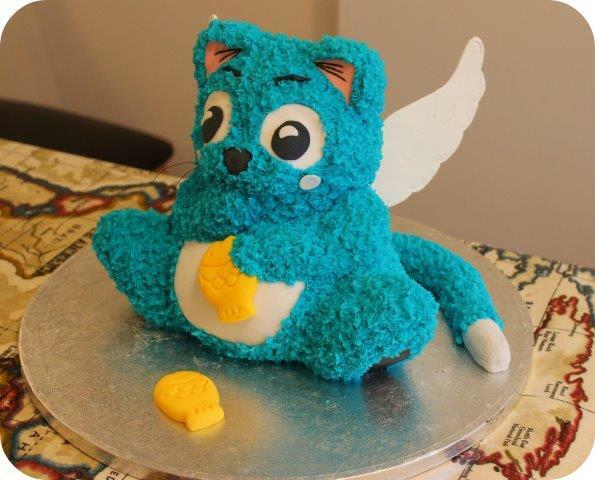 He was made of a basic Chocolate cake and covered in buttercream and fondant, even his wings were edible. 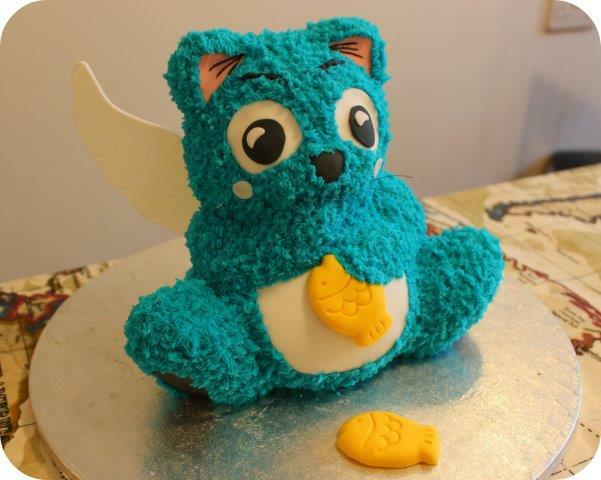 As you might imagine he took quite a long time to make and plenty of concentration, so I can see why so many parents buy their cakes instead! If you aren’t brave enough to attempt your own custom cake or you’d rather just leave the stress to the experts (I don’t blame you) then there are plenty of great cake bakers out there who’d be happy to take your ideas and turn them into reality. 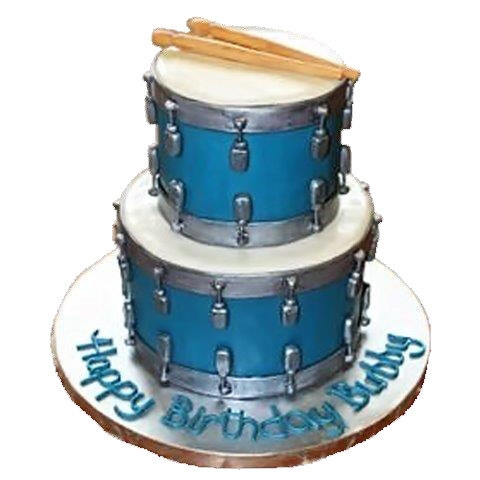 Most have wonderful websites full of amazing pics too, my favourite at the moment is NYC Birthday Cakes ,I’m completely in awe of their skills! Just check out this ice-cream theme! 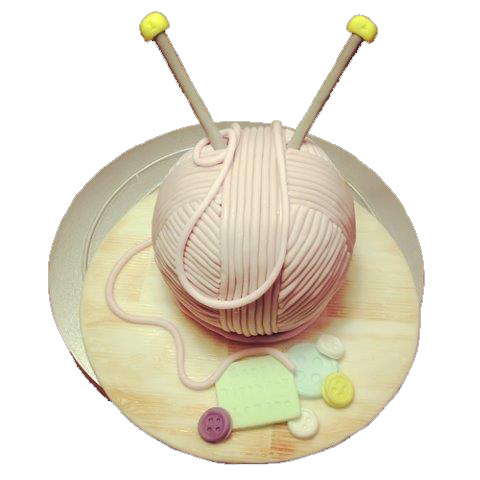 I really want this crochet/knitting ball cake just for me! What would your dream cake look like? Or have you ever attempted a custom theme only to fail miserably (I certainly have)? 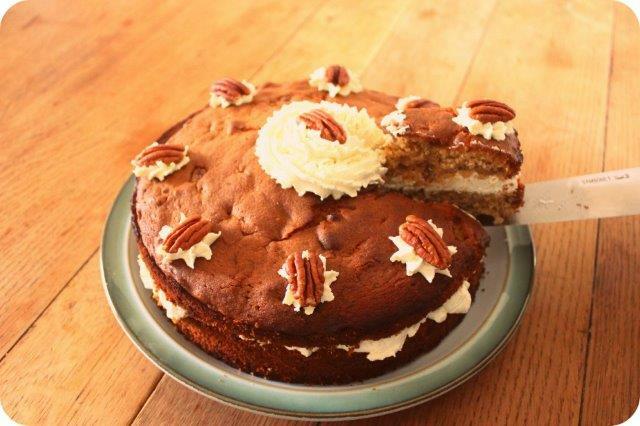 There’s nothing like a slice of homemade cake to lift your spirits and with todays recipe you’re bound to have a happy tummy too! My husband loves Coffee and Walnut cake but it’s not one of my faves, so when he requested one recently I had to make my own version and came up with this incredibly easy Coffee And Pecan Cake Recipe. The pecan offers a slight twist on the walnut but it’s still a traditional flavour combination. Then the cake is filled to bursting with freshly whipped cream delicately flavoured with Kahlua coffee liqueur. Combine the flour, butter, sugar and eggs in a large mixing bowl and whisk until light and fluffy. Add the Espresso, I recommend using some that has been freshly made and cooled slightly. Chop the pecans and fold into the mixture. Divide the cake batter between two oiled cake tins and bake in an oven approximately 175C/ 350F/ Gas Mark 4 for 30minutes or until cooked through. 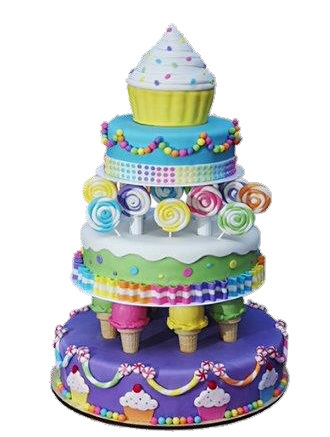 Cool the cakes on a wire rack. Once the cakes are cooled it’s time to make the filling. How much cream you use depends on your own preference (I like a lot!). Whip the cream using an electric mixer and then add in coffee liqueur to taste, adding 1/2 tbsp at a time. Sandwich the two cake halves together using the cream. Finally decorate the top of your cake with a few piped blobs of cream, then pop a pecan on top of each blob and push it down ever so slightly.